Discussion in 'The Lounge' started by sanjuro, Aug 29, 2005. I just came back and if you have any complaints about overcrowding, traffic, tv, or anything other problem of living in the lower 48 states, go to Alaska. You will be on your own, literally. so where are the P I C S damnit! what part did you visit? did you do any riding? I'd love to visit Alaska sometime. Why'd you go - vacation? Family? So which part did you go to? I was in Fairbanks, but this was not exactly your cruise line or mountain climbing trip. My friend's band Small Axe (www.smallaxerock.com) was touring Alaska, and I joined them for the Fairbanks leg. They played places like the Marlin and the Blue Loon, and I saw the inside of a couple of roadhouses as well, particularily the Howling Dog. We stayed in a small cabin without running water, and even the most simple household tasks were chores. The people there were independent and cool, and they all had stories about bear attacks and 30 below winters. Even the waifish Indie Girl told me a story about living in a cabin with her family in a remote section. 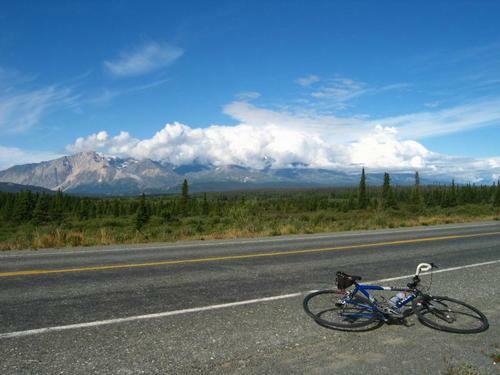 I knew I would not get a chance to see the wilderness of Alaska, but I am going back next summer, just me, my bike, and a bob trailer. If you're going to go back and visit again, you have to go south to the Kenai Peninsula and visit Soldotna. I was born and raised there, and just recently relocated to Scottsdale. Best salmon fishing in the world, bar none. Go in July, you'll get the tail end of the king run, and the strongest part of the sockeye run. Or if you want to catch a fish with the most fight, go in August and fish for cohos on the Kenai. Just pack a lot of mosquito repellent. I don't care where you live, you ain't seen skeeters til you go deep into the woods of Alaska. I mean ... how do we know you even went with out pics?? ?